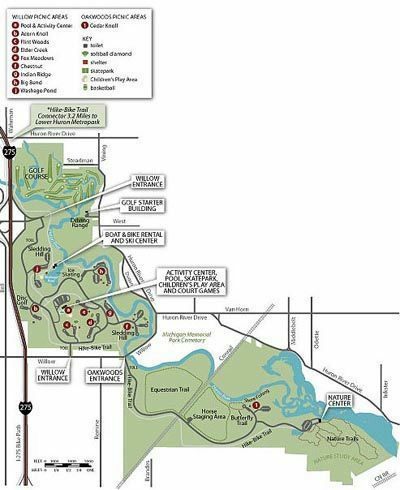 Oakwoods Metropark is a 1,700-acre unit of the Huron-Clinton Metropolitan Authority, which oversees a system of thirteen parks along the watersheds of the Huron and Clinton Rivers. Oakwoods includes a stretch of the Huron River just upstream from the Flat Rock Dam. Here the Huron is a sluggish waterway filled with marshy islands and small bayous, a perfect place for waterfowl and bird life to gather. Most of the river lies in a 400-acre Nature Study Area that features a nature center and is accessed by four interpretive trails, ranging from 700 feet in length to 2 miles. 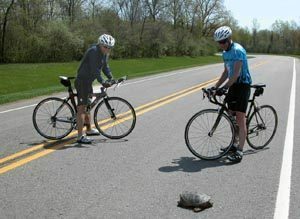 Other trails in the park include a 3-mile segment of the paved hike-bike trail that winds 15 miles through Lower Huron, Oakwoods and Willow Metroparks and a mile-long marked canoe route called Walk-in-Water Trail. Overall the terrain at Oakwoods is flat and much of it open, grassy meadows, making hiking and cycling easy. But the interpretive trails wind through a wood lot along the Huron River for a far more scenic walk and one that appeals to young children. 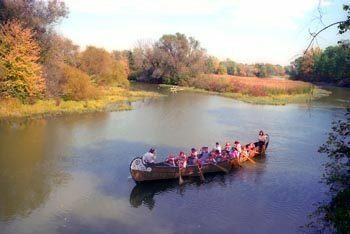 Oakwoods has picnic areas with tables, grills and shelters and a Voyageur Canoe that is used for naturalist-led paddles on the Huron River. Oakwoods Nature Center is a good introduction to any day in the park. There are several excellent hands-on displays inside as well as exhibits of live animals. One of the exhibits is a huge turtle pond where more than a dozen turtles will be lazily swimming through the water or climbing onto a large rock to sun themselves under a heat lamp. In addition to the live animals on display, you can peer into a wasp nest nearly three feet long or stop at the wildlife viewing room to watch birds at the bird feeder. The park is open from 8 a.m. to dusk daily and the nature center is open from 10 a.m. to 5 p.m.. daily in the summer. During the school year the hours at the center changes to 1-5 p.m. on weekdays and 10 a.m. to 5 p.m. on weekends. There is a vehicle permit fee is required to enter the park. The park is located in the southeast corner of Wayne County and is reached from I-275 by departing at exit 13 and heading east on Sibley Road. Turn south (right) on Huron River Drive and follow it 4 miles to Willow Drive. The park entrance is just west on Willow Drive. It’s a 2-mile drive along the park road to the parking lot and nature center. Contact the Oakwoods Nature Center (734-782-3956), the park headquarters (800-477-3182) or the Metroparks Authority at (800-477-2757) or www.metroparks.com.